Galla at sunset in the US. In 2016 when Sandra Leiser and Leanne Ksiazek were vacationing in Tobago, they had no idea that a small brown and white stray puppy from the streets of Buccoo would steal their hearts. Named Galla, after Galla Trace in Buccoo where she was found, the pup (estimated birthdate February 2016) displayed amazing abilities for an animal of her age. Many tourists who come to Tobago fall in love with stray dogs (often referred to in animal loving circles as ‘Tobago Terriers’) and pay thousands of dollars in airfare to get them back to their countries (USA, UK and Europe are the most common destinations). For many locals, this level of love for the Tobago ‘pothound’ is baffling, as these dogs are typically not seen as much more than alarms (to bark when strangers enter the yard) or as non-sentient beings fit to be chained in the hot sun, sometimes without food or water. 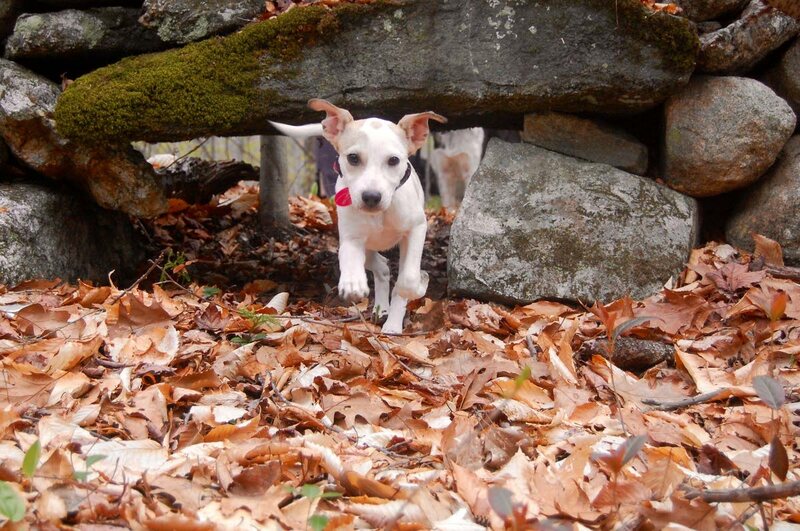 Once Galla was at her new home in Massachusetts, she began to benefit from the influence of Leanne, a veterinarian by profession with a passion for training dogs for performance sports like Canine Agility (obstacle course running), Competition Obedience, and Rally Obedience (similar to formal obedience but with additional series of trained behaviors). “She was a sponge for training and learned multiple skills at a very early age,” Leanne says. “This showed us she was capable of a bright future in dog competition. Galla possessed the genetic attributes to succeed in dog sports similar to our pure-bred Alsatians, if not better! She has been a joy to train, always willing to please and to try until she succeeds. Her athleticism and endurance are remarkable. She is a fast, driven muscle machine! Many foreigners who adopt Tobago strays comment on their high level of intelligence. It is as if the need to survive is embedded in their DNA. The ‘street smarts’ required to find food and stay alive in a world that is often cruel to them, seems to result in a level of brain power and understanding that is astonishing. Galla, an excellent example of the unique capabilities of the TT ‘pothound’ is, to our knowledge, the only Tobago ‘Terrier’ thus far who has been entered on the US canine competition circuit. One-time stray dog, Galla poses with her ribbons after her winning performance last Sunday at competitions at the American Kennel Club. 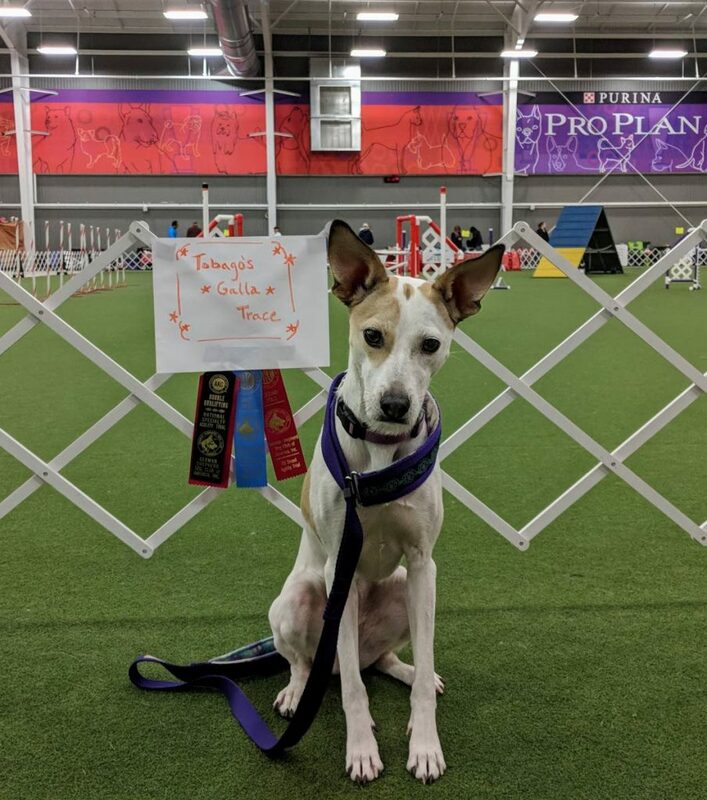 “She has moved up the ranks of AKC (American Kennel Club) Canine Agility quite easily, earning multiple qualifications and top three finishes in her class. 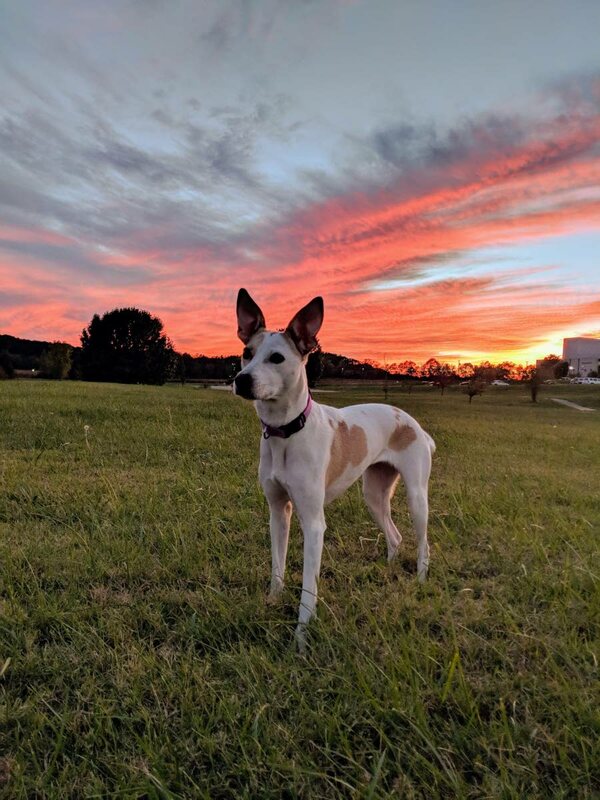 We are very excited about her bright future in competition and she will soon branch out to compete in Obedience and Rally Obedience as well,” Sandra says. Galla also recently won several agility titles and an AKC “achiever dog” award—for dogs who have been successful in more than one sport. Galla also received her Novice Trick Dog title, currently knows 25 tricks, and is working on additional tricks to add to her repertoire. Most recently, last Sunday, October 14, Galla competed in the AKC’s agility trial, put on by the German Shepherd Club of America. She was the only stray/mixed breed in a competition full of mainly Alsatians and sport dogs. People who are of the opinion that only ‘special breeds’ can compete and be victorious will be amazed to know that this little stray pup from Buccoo placed first out of ten in her category, planting Tobago on the map as the birthplace of a canine champion! Her first competition that morning was an American Kennel Club master jumpers course at 16 inches. (The classes are divided by height/size of the dog). She came in second in the highly competitive 16-inch height class. The second run was an American Kennel Club master standard course at 16 inches. Galla came in first. “Masters level is the highest level in AKC and a dog has to have completed two lower levels before competing on masters courses,” Leanne explains. To anyone who has ever abused, neglected or deemed a Tobago pothound unworthy—take a closer look at your own dog(s) and at the common strays you see strolling along sidewalks or sleeping in the sand on the beach. They are all champions in their own right and should be treated as such. With love, care, proper nutrition and training, our wonderful Tobago dogs will win not only competitions, but the hearts of people the world over. Reply to "Buccoo pothound triumphs at American Kennel Club"